Stunning Lake Atitlán - a body of water in a massive volcanic crater in Guatemala’s southwestern highlands. The lake is a UNESCO World Heritage site. We will stay on the lake's southern shore. RWF volunteers at Project Safe Passage in Guatemala City. The Rainbow World Fund Guatemalan Journey is an educational and cultural experience. We will learn from Guatemalans about the realities in their country by visiting projects that serve the Guatemalan people and engaging in social, cultural and artist exchanges. The trip includes visits to diverse communities, meeting with leaders from a variety of fields, and spending time with the LGBTQ community to learning about their struggle for their civil rights. We will experience great Guatemalan hospitality and there will be plenty of opportunities to practice your Spanish. The program strives to connect participants with the realities, struggles and hopes that Guatemalans experience each day. We also hope to bridge connections with Americans and Guatemalans in order to build understanding and partnerships. This will be RWF's eighth trip to Guatemala. Arco Santa Catalina in beautiful downtown Antigua. The iconic archway dates to the 1600s. 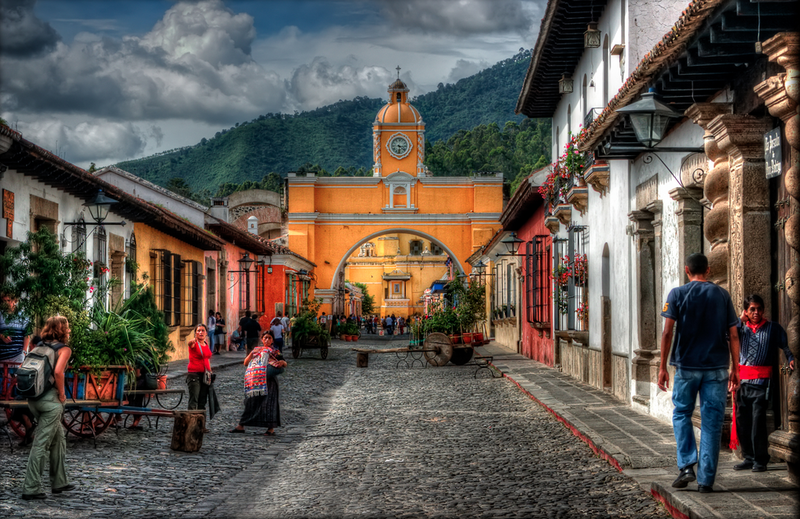 Beautiful Antigua, the former colonial capital of Guatemala, has many Cathedrals and historic building. Visiting the Women in Solidarity Clinic in Guatemala City. The surgical lamp is a gift from Rainbow World Fund. Rainbow World Fund has been visiting Guatemala since 2004. Since then over 100 RWF volunteers have delivered 7000 pounds of medical and school supplies valued at over $900,000 along with over $130,000 in grants. Some of the many projects that RWF supports include a women's clinic in Guatemala City, an orphanage in Santa Apolonia, a water project in the Mayan village of Tapesquillo, a school in Santa Cruz del Quiché, Project Safe Passage at the Guatemala City garbage dump, projects that support the LGBT community in Guatemala City. Trip participants are asked to collect medical and school supplies during the months prior to departure. Each person is allowed two 50lbs bags plus carry-on baggage on this international flight. We encourage people fill their suitcases with life saving supplies that we will distribute in Guatemala. We will provide guidance on what medications to collect. Our groups have made a huge difference in the lives of hundreds. These vital supplies come from doctors and hospitals in the U.S. that we contact before our trips. We also bring down over the counter medications and vitamins. Simple medications like Aspirin, Ibuprofen, Imodium, and Hydrocortisone cream are beyond reach of most Guatemalans and are greatly appreciated. The antibiotics, anti-fungals, diabetes medications and HIV medications all mean the difference between life and death in Guatemala. We will visit several schools - these boys were perfect hams. RWF meeting with LGBTQ activists in Guatemala City. Guatemalan girls in their traditional clothing from the town of Santa Catarina Palopó on Lake Atitlán. We will be traveling as a humanitarian aid group and our itinerary reflects this. Each journey is unique and we are still creating the itinerary for the trip. 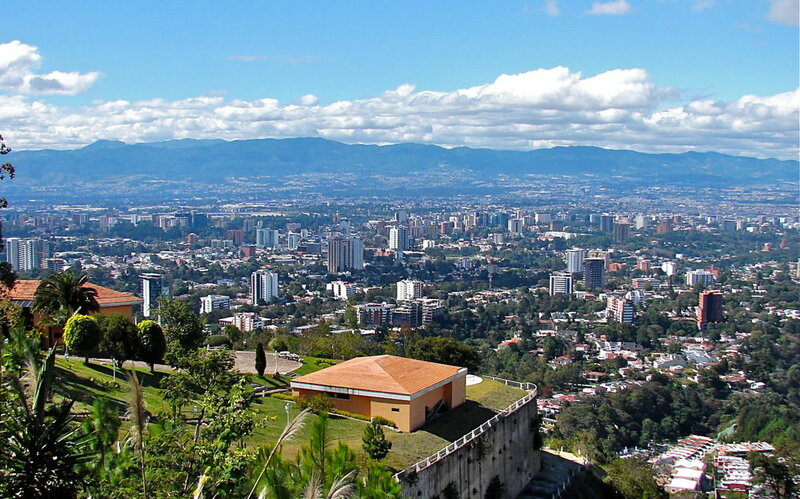 Our current itinerary begins in Guatemala City where we will visit projects that serve the LGBTQ community including OTRANS a nonprofit that services the transgender population. OTRANS runs a defacto "underground railroad" that helps transgender woman from Guatemala, El Salvador, and Honduras find safety, supportive community, and work. We will also meet with REDNADS a leading LGBTQ civil rights nonprofit. 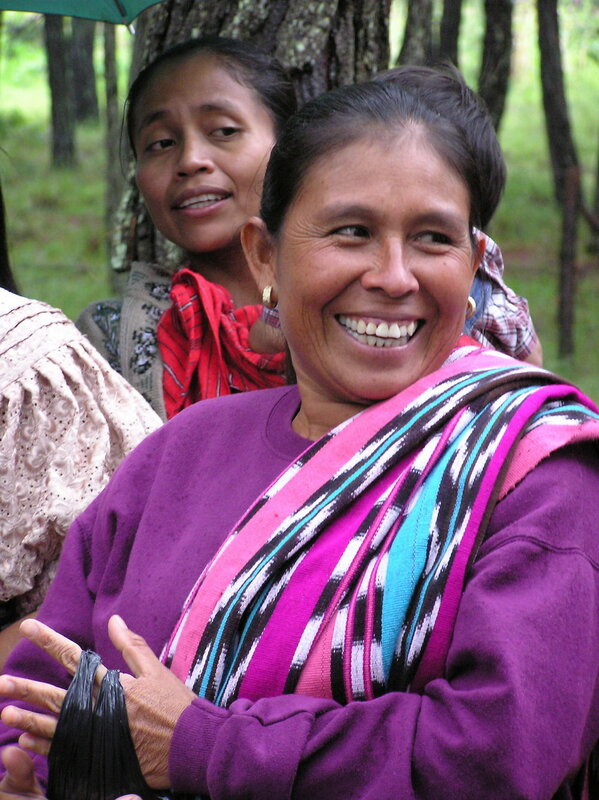 We will visit the Women In Solidarity Clinic and learn about the many challenges that Guatemalan women face. While in Guatemala City we will also visit the headquarters of international nonprofits and sites of historic and cultural significance. Guatemala City viewed from the Carretera a El Salvador neighborhood. Palacio Nacional de la Cultura (National Palace of Culture) in Guatemala City also known colloquially as "Palacio Verde" is the headquarters of the President of Guatemala. Tikal was one of the most powerful kingdoms of the ancient Maya. Situated in the department of El Peten, this site is part of Guatemala's Tikal National Park. In 1979 it was declared a UNESCO World Heritage Site. Amberjoy Leonard with children at an orphanage in San Antonio. 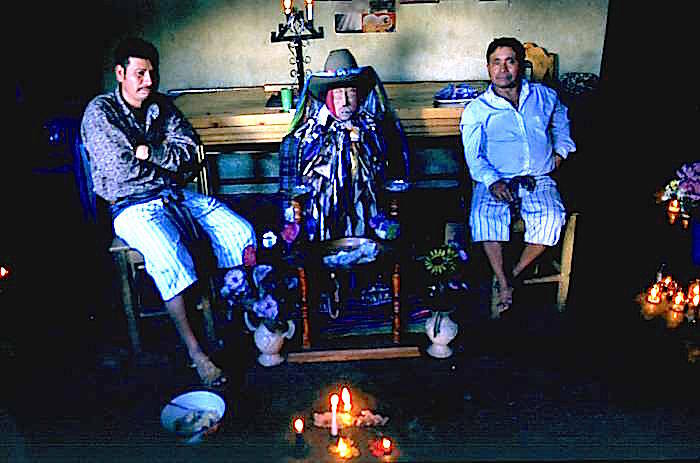 We will have the opportunity to visit Mayan villages and learn how they have maintained their customs and traditional way of life. Vibrantly painted school bus are everywhere in Guatemala. They are the primary mode of transportation for goods and people between towns and cities. The trip cost is $2,350 (this price is approximate, we are awaiting 2019 figures from Guatemala, should have finalized price by 4/15/19) and includes all hotels and accommodations, in-country transportation by private van, all meals, gratuities, translation and guide services, speakers fees, entrance fees to special events. It does not include round trip air transportation from the USA. Participants have the opportunity to take optional day trip (via airplane) to visit the Mayan ruins and juggle at Tikal. Our guides for the trip are two American Catholic Sisters who Rainbow World Fund has worked with for many years. These inspiring women lived in Guatemala during the civil war and have served the Guatemala people for many years. They have amazing knowledge and connections that make our journey extraordinary. If you are interested in this trip please click this text and send us an email to set up an interview. A Mayan weaver with her daughter. Backstrap weaving is a part of the culture of the western highlands of Guatemala. Young girls begin learning how to weave at about 7 years of age. The Hero Twins from the Popol Vuh - a cultural narrative that recounts the mythology and history of the K'iche' people who inhabit the Guatemalan Highlands.